I hope to work my way through all of Buchan’s books so when I saw this one for sale in the library I snapped it up. It’s a continuation of Richard Hannay’s adventures, a good few years on from The Thirty-Nine Steps, and the now Sir Richard Hannay is married to Mary and they have a 14 year old son called Peter John. He’s in a very comfortable rut and living a pleasant country- gentleman’s existence when the past pops up and Hannay finds himself embroiled in another adventure with his old friend Sandy, now Lord Clanroyden. Years before whilst on another jaunt in South Africa they had taken an oath to protect the explorer and prospector Haraldsen and his descendants, they hadn’t really taken it seriously at the time but when they discovered that Haraldsen’s son was being hunted down by a nasty set of characters, they feel obliged to go to his aid. The action moves from Buchan’s beloved Scottish border country to the Norlands and The Island of Sheep (The Faroe Islands). Another enjoyable ‘Boys Own Storybook’ sort of a romp ensues. I enjoyed this one even more than The Thirty-Nine Steps although towards the end it does feature a whaling ship and its crew, it was a surprise to me that it was sort of frowned upon, even in 1936 when the book was published. 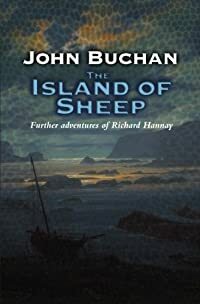 This entry was posted in Books and tagged 1930s fiction, adventure story, John Buchan, Richard Hanney, Scottish author, The Island of Sheep, thriller by Katrina. Bookmark the permalink. I’d like to read more his Richard Hannay stories as well. I found a used copy of Greenmantle a while back so will read that one next. Interesting about the whaling–I would have expected it to be frowned upon but much later in time. I think that Greenmantle is my favourite one so far, I hope you enjoy it. I thought that it was about the 1980s when anti-whaling sentiments became the norm. It just shows you that there’s nothing new under the sun!